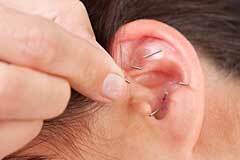 Auricular therapy is based on the theory that different parts of the body have a reflex association with specific points on the auricle of the ear. It works by applying stimulation to these points to treat pain, balance emotions, detoxify, and balance hormones. To book a treatment or consultation with Lynn, please call 07789937843 or fill in our contact form.